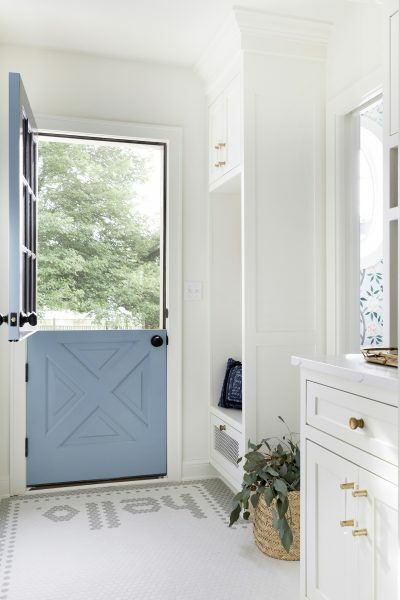 When James from Homey Improvements contacted me hoping to share a step-by-step guide for painting cabinets with chalk paint my answer was a resounding, heck ya! I’ve used chalk paint to paint a couch and to paint my DIY pedestal table but never to paint cabinetry. I hope you find this tutorial as helpful as I did! Bio: James is a kombucha tea-sipping blogger who focuses on DIY projects and sustainable living via his family blog Homey Improvements. He enjoys pilates and loves his job as a green construction builder. 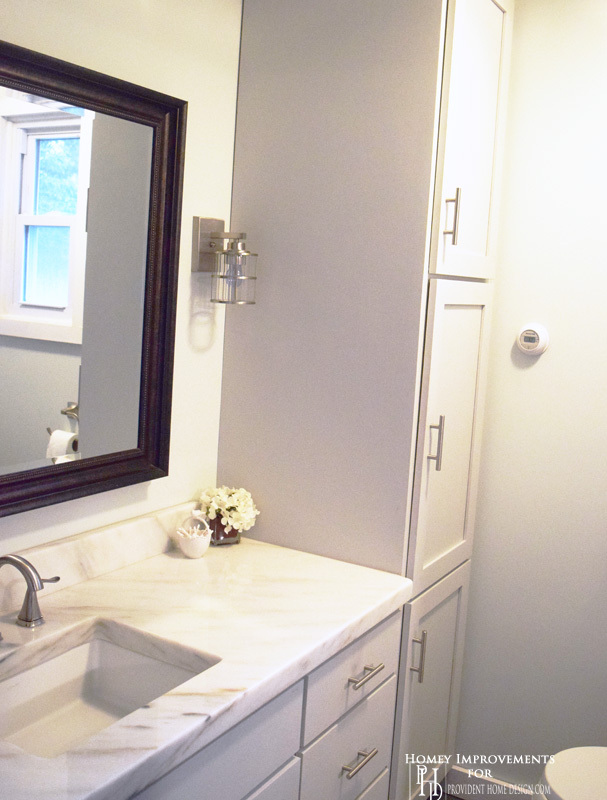 Are you looking for a way to renovate your bathroom or kitchen cabinets without hiring a contractor? Hate priming even more than you hate sanding? Then this is the project for you. Chalk paint is a DIYer’s best friend, so grab a screwdriver and start taking apart your cabinets. It’s time for a cabinet makeover! Remember your last painting project and the loads of sandpaper and bucket of primer you had to use? Chalk paint does away with all of that. No sanding, no priming and it dries quickly. That’s a big time-saver. If you’re painting inside, this is the time to tape newspaper to the floor. Really, painting outside in natural light would be ideal, but I know taking the entire cabinet off the wall wasn’t an option for me, so it probably isn’t for you. Wipe down the cabinets and make sure all the gunk is gone. Tip: Toothpaste clumps will ruin your paint job. 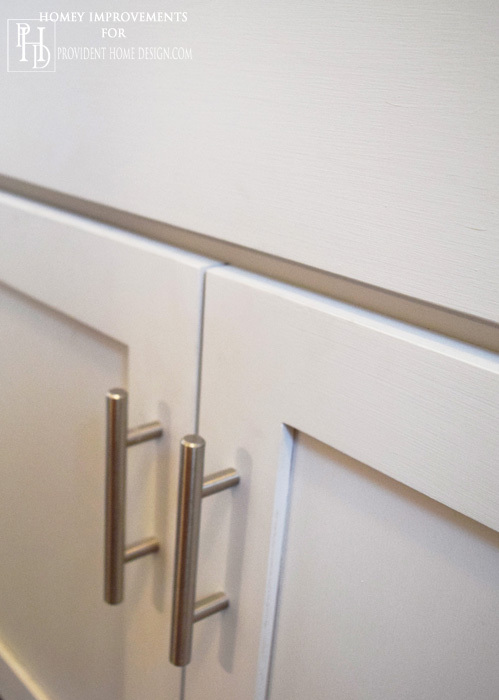 Remove the hinges on the cabinets so you can easily paint the doors. Tip: Store hinges and screws in a Ziploc bag or Tupperware. Don’t sand – unless you find a rough patch. This paint isn’t actually magic, it’s just close. Sure, you can open the can of paint and stir it with that plain old wooden stirrer they give you at the paint store, or you can work those arm muscles and do a shake dance with the paint can. If you plan on making your own chalk paint, you’ll need to go to a store to get the paint can with the powder (either calcium carbonate or plaster of Paris) in it professional shaken. Just like that, it’s time to paint. From my experience you’re going to need two coats of paint. I’ve heard of people using more, but that was plenty for us. The paint’s overall texture is thicker than normal latex paint, so be careful. The good news, though, is that even though this a fast-drying paint, you’ll have enough time to spread it out without fear of leaving brush strokes. Don’t panic if you see brush strokes in your first coat. They’ll disappear in the second coat. If you want a shabby chic look, use sandpaper after your paint dries but before you apply the wax coating. There’s no way around it — applying a wax coating sounds weird and difficult. Don’t worry, though; this step is a snap. To apply, scoop a small amount of wax onto your paper plate to prevent contaminating your canister of wax. Smoosh your brush into the wax, but make sure you don’t get too much. How much is too much? Treat the wax like you would foundation on your face. A little goes a long way; you don’t want your face or your cabinet to melt halfway through the day. Work the brush with the grain of the wood/paint and not against it. You should see the color brighten up just a bit, but not enough to alter the color, so don’t worry about that. Once you’ve applied a fine coating, grab your soft rag and brush the surface. Think “Karate Kid” for this one. Wax on, wax off. It’s important that you don’t leave too much wax on the furniture. Wipe with the grain of the wood, and if you touch the wax and come away with any residue on your fingers, keep wiping. Just like paint, the wax has to dry. Give it at least 24 hours to dry and then you’re ready to go. 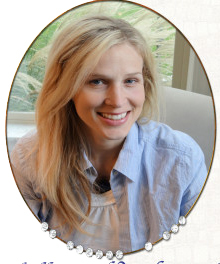 If you’d like a visual, watch this tutorial by Paula Driesell from Locksley Lane. Use wax sparingly – you can add more, but you’ll struggle removing excess. I accidently applied way too much to the first cabinet and realized we were actually leaving fingerprints on the cabinet because of the wax. Since wax easily shows fingerprints, you might want to consider using polycrylic (though it changes the look of the chalk paint slightly). Once the wax has hardened, your cabinets will look just as good as mine. And they do look amazing, James! Thanks for sharing this tutorial with us!! In the chalk paint projects I’ve done I’ve used Minimax’s Paste Finishing Wax and have loved it. You can find it for the best price, Here! There is so much to love about this bathroom–the soft greenish-blue paint on the walls, the marble countertops and undermount sink, the lanteen-styled wall sconce, the espresso framed mirror to add contrast, the L-shaped cabinetry, the sleek cabinet pulls, and of course the flawlessly painted cabinets! Excellent work! 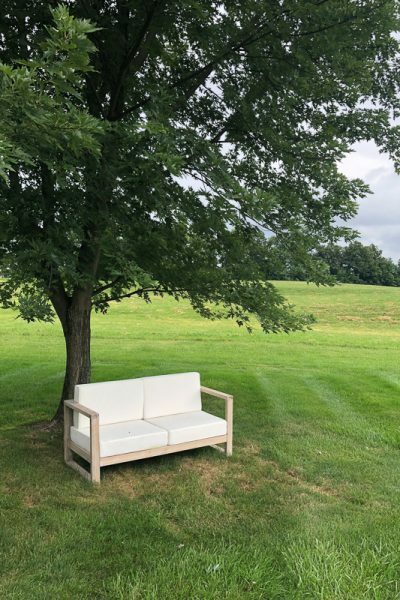 You can head over to Homey Improvements and check out James’ blog HERE. I have used chalk paint many times, but always on smaller pieces of furniture. I have heard it was great for painting cabinets, so this tutorial is so helpful. The waxing process always freaks me out 🙂 Thanks for sharing!! Will it stick over oil based painted items ? I would recommend using a de-glosser first. 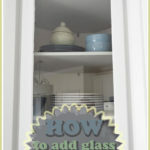 If you are making your own Chalk Paint what do you use to add a different color? Say I wanted to a shade of blue how and when and what do I add to make my paint blue? Thanks for your help. Hi, Teresa! The chalk paint I have made is made with 3 things– calcium carbonate ( white powdery substance), water, and latex paint. Latex paint is the same paint you paint walls with. So all you have to do is go to a store with paint and look at their paint fan decks that show all the colors (it doesn’t matter whhat brand) they have and pick the one you want just like as if you were going to buy paint to paint a wall. 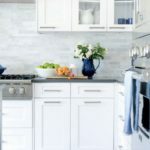 What s out painting kitchen cabinets with chalk paint? Hi, Dawn, could you try your question again? Loving the sound of this and am looking at a sideboard just crying out for chalk paint! Will definitely try it but on a smaller item first. Thank you! 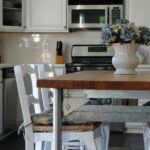 I have used chalk paint on a redo kitchen table and 6 chairs…Annie Sloan. I used poly acrylic finish. I love Annie Sloan because of the color palette and they are all meant to mix together and layer colors. Rather than sanding, we were told to use a damp clean cloth to wipe off where you want to expose the under color. Do this when the chalk paint is dry to the touch, but not cured. It gives you better control and a smother finish. I have taken some classes and was taught to make sure you keep the paint brush wet, as with water. It doesn’t weaken the color and goes on very smoothly. You can really extend how far this little bit of paint can go over a much larger area. I’m ready to do my kitchen cabinets and have done some sample boards using the wax finish. I am told the wax should be worked into the paint, thus the put on, wipe off process. The paint and wax bond together and the wax must cure for at least 30 days, which will stop you from getting finger prints. It really does provide a very hard finish and looks lushes! 2 applications of the wax is important, but the 30 curing is a must! Can someone tell me the best way to clean your wax brush after you use it? Since was requires reapplying over time, I would prefer to seal my cabinets with polycrylic. Is there a strong reason NOT to use this? Not that I’m aware of Sherry! Will this work on cabinets that have texture to them? Hi, Jessica, yes but it will still have the texture. Are you trying to get rid of the texture? If so you will need to sand first. hi. My cabinets seem to have several coats of very shiny poly over them. Should I do anything differently than wipe down? Thanks. Hi, Peg, you will probably be fine but if you want to be sure I would suggest using deglosser. Here is a link to one on amazon, http://www.amazon.com/Klean-Strip-Quart-Liquid-Sander-Deglosser/dp/B0002YU7RU/ref=sr_1_5?ie=UTF8&qid=1451063813&sr=8-5&keywords=deglosser. I haven’t used this one but I used a deglosser that came in a Rustoleum Cabinet Transformations kit and really thought it prepared the cabinets well for being painted. Best wishes!! My kitchen cabinet doors have laminate on them that is lifting and peeling off. Underneath, the doors are made from MDF. I’m thinking, “just pull it off of all the doors and paint them” figuring on priming them before painting. I could save a lot of time with chalk paint if I don’t have to prime. Have you ever chalk painted on MDF? Any special instructions I need to know? Thank you for answering back so quickly Tamara. Yes, the MDF is very smooth, so I can eliminate both steps (sanding and priming). Big Smile! Hi Jane! 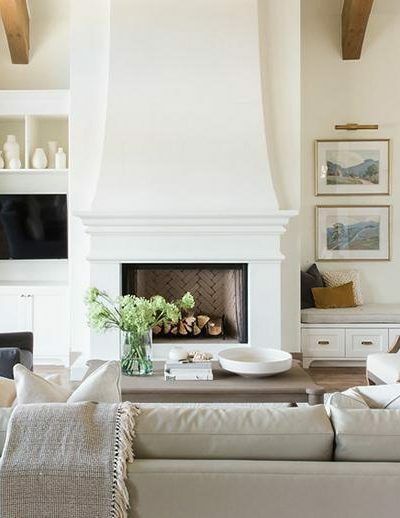 I’m pretty sure I can picture the kind of furniture you are talking about and from what I’ve read about chalk paint it seems as though you could use it on your gloss furniture. 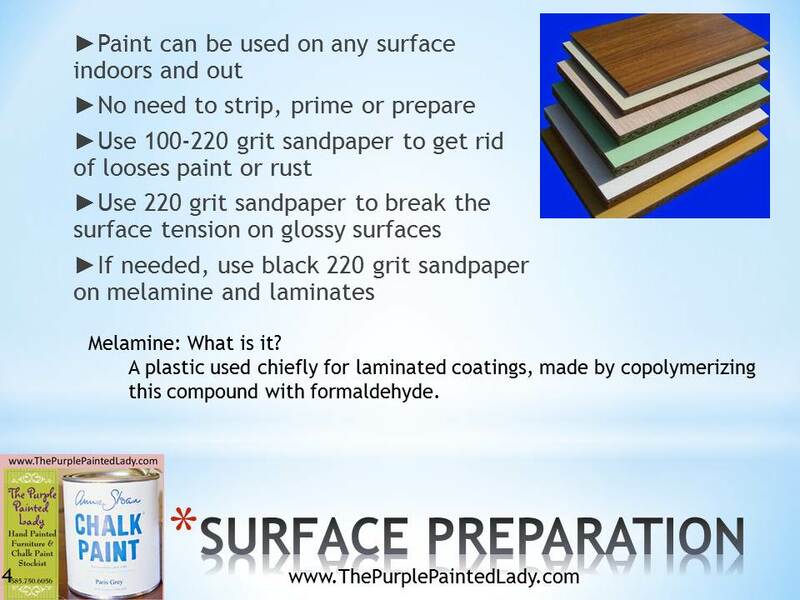 You may want to do some light sanding first though, here is a link with some specific tips, http://www.thepurplepaintedlady.com/wp-content/uploads/2012/02/Melamine.jpg. I’d love to hear how it goes!! Love the tutorial. 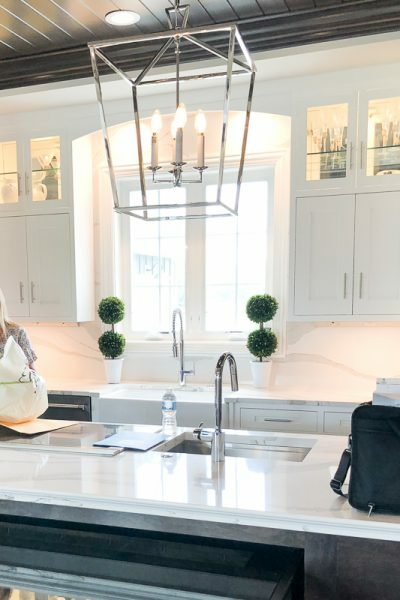 Could you please please tell me what kind of cabinets those are? I have the exact same ones (came with our house), and have been looking all over to buy more. Hi Veronica! I’m so glad you enjoyed this post! It was a guest post from James at Homey Improvements so unfortunately I don’t know about his cabinets. But here is his email address I’m sure he would be happy to answer your question, jgwhitecavage@gmail.com. they look like Ikea to me! Hi Shelley! 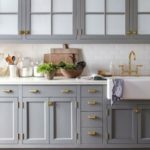 :-) This was a guest post so I haven’t actually painted bathroom cabinets with chalk paint so unfortunately I’m not quite sure about the clear wax and humidity. 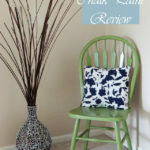 I like using Behr (flat sheen) when making my own chalk paint. 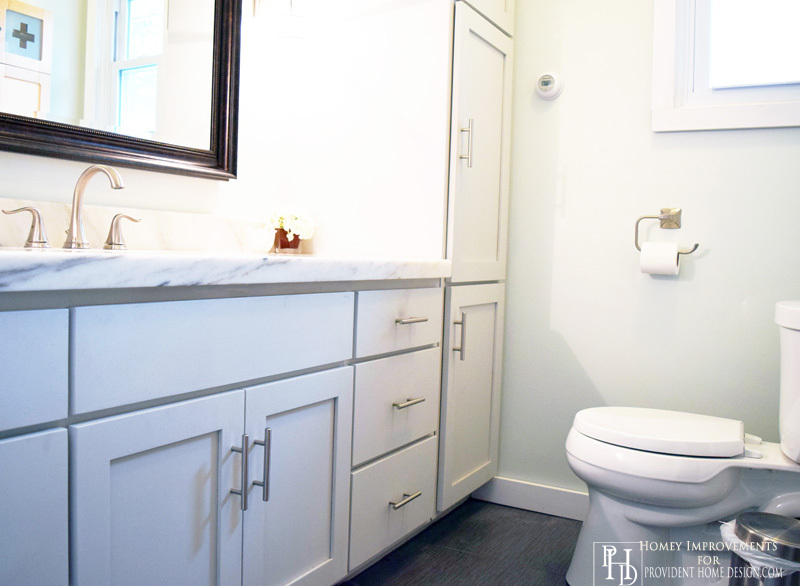 I have painted my bathroom cabinets with this product and love it, http://providenthomedesign.com/2014/10/18/paint-bathroom-vanity-like-professional/. My chalk paint leaves streaks help!!! Hmmm, how many coats have you put on? what kind of was is it? Is it in the paint departments, or like car wax?? Hi, Shari, have you tried sanding the “clumpy” parts down with fine grit sandpaper? That should help. If the paint seems clumpy it needs to be mixed better. If it is in a can you can take it to any paint area and ask them to shake it up for you. If it is DIY chalk paint you can try adding a tad bit more water and giving it a really really good mix. Let me know how it goes!! Hi Gertrude I don’t see why not. It is suppose to adhere to all kinds of surfaces. I think it would work! I need Help I have done 3 coats and it looks rough and i can see the strokes. 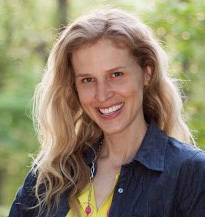 Hi Krista! I’m sorry it isn’t going as expected. I would try lightly sanding them with fine grit sand paper and then applying a fourth coat and see if that solves it. Let me know how it goes! Has anyone got a recipe for how much of each product to use for a gallon of paint? Chalk paint goes a long way but I don’t think the cup recipe would last too long. 😉 I like to make my own but have only made small amounts for small projects up till now. 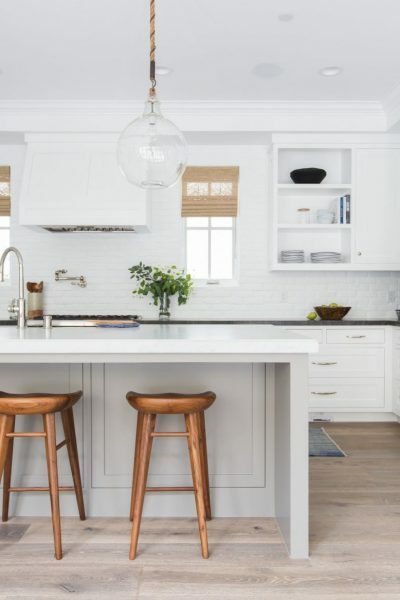 It wears really well and I am hoping would do so on the kitchen cabinets too. Thanks for the post. Thank you. Great directions. Btw, it’s Minwax, not Min-i-wax. 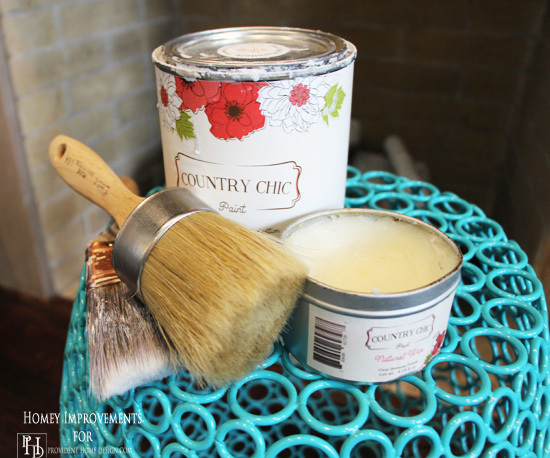 Can you chalk paint over oil based paint? Hi Robinette! Yes, you should be able to use chalk paint over an oil based paint without a problem! If for some reason it doesn’t seem like it’s adhering well then you could try putting down a coat of primer first. is annie sloan chalk paint “self-leveling”? Thanks! Hi, Bonnie, thanks for the question! I actually haven’t used Annie Sloan chalk paint before but from the research I did it seems that the general consensus is that her chalk paint is not self-leveling. Hope this helps! Hello there , would it be ideal to use wax in on kitchen cabinets , seeing that it can get really hot in the kitchen ? I’m actually reading now from different peoples blog that you should not use the wax because it is so hard to clean when it gets dirty. There is a matte finishing coat you can get instead of the wax. I am seeing lots of people having to re paint because of the wax. Hi, Bonnie, it would be because of the chipping that you would need to lightly sand. 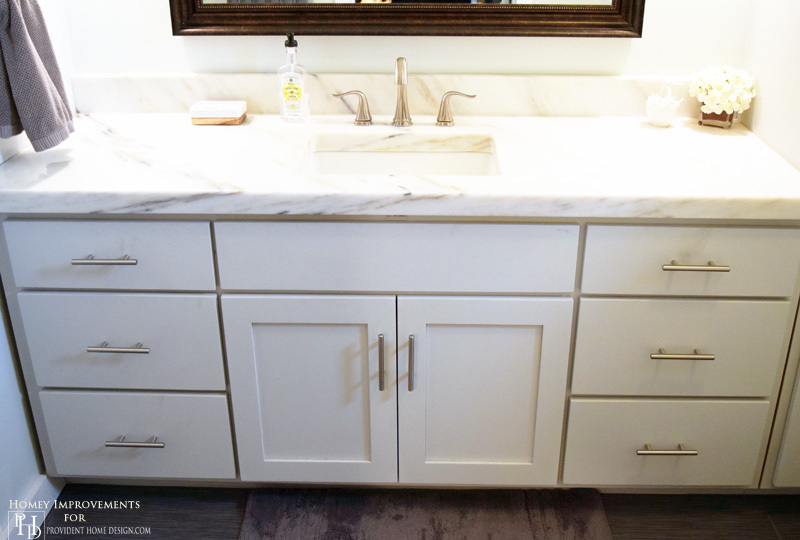 tamara….I am redoing my bath and want to do this to my bathroom cabinet….I am also painting my walls….should I paint my walls first and then do the cabinet or vice versa? Hi, Kathy, I would do your walls first then the cabinets. Happy painting!! Hi! I’ve used chalky paint & wax & distressing methods on real wood furniture. 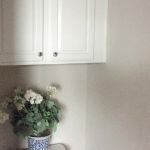 I want to redo my kitchen cabinets but they are laminate with MDF. How can’t I use diy chalky paint to accothis. I’ve lived here 15 years I rent the owner doesn’t want to sell but I paint interior exterior redo my backyard & terrace & landscaping. I need to do something about the kitchen! Can you give me some advice? This is great! Im a realtor and have been advising my clients to update their old oak bathrooms to white before selling. Makes a HUGE difference and this is an inexpensive way to update. 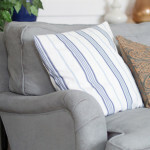 Love this post for it’s easy instructions and links! Thank you. So is the wax applied by your fingers? or with a soft rag? or the wax brush? I read how he said fingerprints show up easily with wax…..? Loved reading this! Thanks! I used Annie Sloan paint and wax on my dinning room table , 2 coats of paint 4 coats of light wax over 6 week time…problem was my husband coffee mugs melted through the wax number of times can I reprint the table over the wax then use a shellack over the new paint ? Hi Nancy yes you should be able to paint right over it! 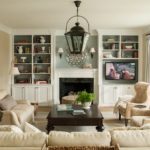 Can chalk paint be used on manufactured home press board cabinets? Used Annie Sloan Chalk Paint dark blue on dinning room chairs then used the Annie Sloan black wax ,but used too much ! Rubbed and rubbed used a electric buffer ,cured for 3 months still getting dark wax marks on clothes ….what to do next ???????? Do you ever use a sponge brush or is the bristle brush the best to eliminate brush strokes? I have used chalk paint before and repainted a mirror, distressed it and put an antique dark wax over it. I have also done a desk/chair all turned out great but I know cabinets in the kitchen will be a lot more work. My question is can you share the process of steps to distress them using the cream chalk paint but having a distressed look around the edges with a darker stain? My cabinets are natural maple colored. Does the chalk paint cover the oak wood grain? Hello, What color and brand of chaulk paint did you use in the attached photos? I would like to copy it for my bathroom. will the steam from the shower affect the durability of the chalk paint on bathroom vanities? The vanity is very close to the shower.